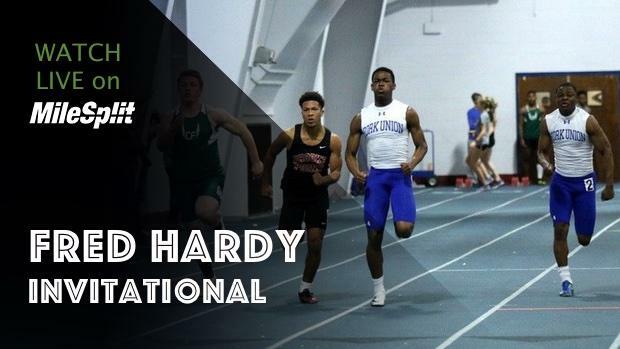 We are pleased to offer your school an invitation to the Fred Hardy Jr. Invitational to be held January 12th, 2019. The deadline for entries is January 9th at 5:00pm. All entry fee money should be in by January 5th when online entry will be available. The link for entering will be posted in the near future on milestat.com and you must be given a password in order to enter. Enclosed is a list of guidelines that we ask you to follow. We hope you will join us as we celebrate the 9th edition of the Fred Hardy Jr. Indoor Track Invitational and the 29th edition of the meet formerly known as the Fork Union Invitational. 1.TWO ENTRIES PER EVENT. PLEASE STAY AS CLOSE AS POSSIBLE TO THE LISTED ENTRY GUIDELINES. 2.ENTRY DEADLINE IS JANUARY 9TH. NO CHANGES ARE PERMITTED AFTER ENTRIES HAVE BEEN SUBMITTED. NO REFUNDS.ENTRIES WILL BE MADE ON-LINE THIS YEAR ON THE MILESPLIT NETWORK. PAPER ENTRIES OR EMAILED ENTRIES WILL NOT BE ACCEPTED. MAIL ENTRY FEE TO : FUMA, BOX 278, C/O WINSTON BROWN, FORK UNION, VA. 23055. MAKE CHECKS PAYABLE TO FUMA. 3.CUSTOM MEDALS WILL BE GIVEN TO THE TOP SIX INDIVIDUALS IN EACH EVENT INCLUDING RELAYS. TROPHIES WILL BE GIVEN TO THE TOP THREE TEAMS IN BOTH GIRLS AND BOYS COMPETITION. THERE WILL ALSO BE FOUR M.V.P. AWARDS GIVEN OUT. 4.ALL CAMPUS BUILDINGS ARE OFF LIMITS. COMPETITIORS CAUGHT IN BARRACKS OR CLASSROOM BUILDINGS WILL BE EXCUSED FROM THE MEET. 5.PLEASE DO NOT BRING ATHLETES AND STUDENTS, WHO ARE NOT COMPETING IN THE MEET. 6. PARKING WILL BE AVAILABLE ON THE BOTH SIDESOF THE CAMPUS INCLUDING BEHIND THE ESTES CENTER. WE WILL ALLOW BUSES TO DROP OFF ATHLETES AT THE ESTES CENTER AND THEN PARK IN THE ASSIGNED AREAS. SIGNS WILL BE IN PLACE TO DIRECT ALL VEHICLES. 7.T-SHIRTS AND CONCESSIONS WILL BE AVAILABLE. FOR QUESTIONS CONTACT WINSTON BROWN AT 434-842-4289 OR 434-842-4280. EMAIL - brownw@fuma.org. EVERY SCHOOL GETS TWO ENTRIES-WE ASK THAT YOU STAY AS CLOSE AS YOU CAN TO THESE STANDARDS. 20 PER INDIVIDUAL ENTRY FOR SCHOOLS WITH FEWER THAN 5 ATHLETES. ENTRY FEE IS DUE ON JANUARY 5TH TO HOLD YOUR TEAM'S SPOT IN THE MEET.